Part of the appeal of science fiction is to journey to places no one has been to before. Other planets, other times, other realities, these are the worlds of sci-fi. But the problem with going to the unfamiliar is the language barrier. If every movie and TV show had to spend time dealing with characters trying to communicate with each other, they wouldn't have time to do anything else. That's why many have adopted some form of translation device, commonly referred to as a “universal translator.” Usually it’s something that can take any language and turn it into another language, instantaneously. Here are six of them from movies and TV. 6. 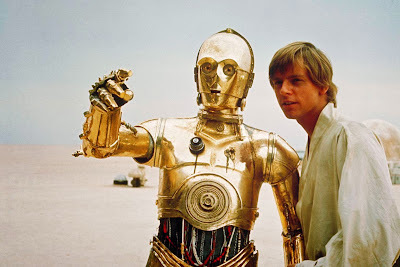 C-3PO (Star Wars) - In a galaxy as chaotic as Star Wars, Luke and Han don't have time to consult a phrase book. That's where C-3PO comes in handy. He's programmed with millions of languages, from Huttese to Ewok. He can even translate machines, although some have a peculiar dialect. 5. Babel Fish (The Hitchhiker's Guide to the Galaxy) - When Arthur Dent is whisked off Earth into outer space, he meets more bizarre aliens than you can shake a stick at, none of whom speak English. Fortunately, his alien friend Ford sticks a Babel fish in his ear. Just stick the fish in your ear, and you can instantly understand anything anyone says to you. It’s also caused more and bloodier wars than anything in history. 4. Translator Microbes (Farscape) - On the TV show Farscape, when astronaut John Crichton finds himself in deep space, he's injected with bacteria called "translator microbes." The microbes live in the brain stem to translate any spoken information. Unfortunately, they don't translate idioms, leading to a lot of confusion (and comedy) over his slang. 3. Universal Translator (Futurama) - In the year 3000, there's no need for a Universal Translator because everyone in the universe speaks English. Professor Farnsworth invented one, anyway, but it can only translate into an incomprehensible dead language: French. 2. Translation Circuit (Doctor Who) - The Doctor's TARDIS can travel to any time or place, which could cause some problems with translation. Fortunately, the TARDIS can instantly translate anything said to the Doctor and his companions into their native language, telepathically. How the TARDIS does this is murky at best, but that's par for the course with the Doctor. 1. Universal Translator (Star Trek) - The term “universal translator” is synonymous with Star Trek. The ability to translate any language into another has not only made things more convenient, but helped bring peace and harmony to Earth and the universe. If only we had one at the United Nations. Which is your favorite universal translator? Do you wish you had one? What would you do with it? I would want a Babel Fish. Who wouldn't want a fishy smelling ear canal. If the TARDIS and all its functions came with the Translation Circuit, then it would be a no brainer. You could land on a Russian nuclear sub in 1985, and listen to the crew speak the Queens English, with no accents! Universal translator? If only we had one at Capitol Hill right now! There's a great scene in the Deep Space Nine episode "Little Green Men" where Quark and his brother Rom and Rom's son Nog are trying to get their universal translators to work. The problem is that they're in the middle of an army base under observation, humans who have no idea what's going on watching as they dig into each other's ears. Maybe it's just the Ferengi who put theirs in there? You have to wonder how they could have programmed Ewok into C3PO. Did the Empire capture an Ewok and extract its native tongue?